Why is Hispanic literature a legacy for future generations? Often, when we refer to the word inheritance, we think about material goods that pass on to the family when one dies. However, there is an invaluable non-materialistic legacy in each human being that goes beyond the immediate circle of the people that surround us and know us. It’s that footprint that we leave in each action of our lives, in who we are and our beliefs. Our legacy reflects the heap of experiences, relationships, values, achievements and principles that left a mark on us and that, without a doubt, have affected others without us noticing. Without that sense of transcendence, humankind would lose the meaning of life. An essential piece of our legacy is the Spanish language and, therefore, literature and oral tradition. The language is a vehicle of communication by which we transmit our traditions, the values and the cultural wealth of our people. To speak of inheritance is to talk about life, about the legacy we received from those who preceded us, about what we live in the present and about what we will build for the future. Susan V. Bosak, the co-founder of Legacy Project, illustrates it perfectly: “Where do you think it’s best to plant a young tree: a clearing in an old-growth forest or an open field? Ecologists tell us that a young tree grows better when it’s planted in an area with older trees. The reason: it seems that the roots of the young tree are able to follow the pathways created by former trees and implant themselves more deeply. Over time, the roots of many trees may actually graft themselves to one another, creating an intricate, interdependent foundation hidden under the ground.” In this beautiful explanation, we can visualize how nature acts intelligently; it shares resources and renews itself. We understand the heritage of Hispanic literature in the same way. What we have today is the result of those roots interconnected in space and time, preserving themselves so that when the young trees arrive, they find a forest that will shelter them and become their cradle so that they can, in turn, grow and multiply, with the responsibility of that legacy. Hispanic Heritage Literature Organization is aware of the importance of its mission in safeguarding the preservation of the language and its wealth, by supporting literature written in our language, so that this legacy accumulated from experience does not get lost and continues its path of growth. Every action we take has a purpose of life and unity. We link together arts and human resource management in favor of education, culture, inclusion, and diversity. We support as much as possible, the communities that speak other languages so that they can also establish organizations that contribute to the promotion and dissemination of their artistic and cultural values. Our work team is comprised of Goodwill Ambassadors, who join this initiative from different parts of the world. The majority are writers, professors, and community leaders, who wish to contribute their experience and intellectual capacity in benefit of the community. To achieve our projects we need the support of organizations that work in favor of cultural and humane advancement, including the artistic and cultural trades, and public and private companies. Our efforts merit the solidarity of Hispanic writers since the literary work is the engine that propels and feeds our existence as an organization. Be a part of this great mission! Together with writers, poets, artists, entrepreneurs, students and the community as a whole, we will be able to achieve positive changes. Your support is vital so that we can continue offering our cultural, literary, artistic and environmental programs to the community. Future generations have the right to receive the legacy of Hispanic literature and art as part of their cultural heritage. Hispanic writers have the right to count on the support of public and private entities to promote their works and disseminate their cultural and intellectual contribution to the community. The community has the right to know and assimilate through education and entertainment the vast cultural and intellectual contribution derived from literary development. Hispanic authors and artist have the right to a law that protects their authorship rights and to receive fair compensation for their artistic and intellectual work. Hispanic children and adolescents have the right to count on the support of public and private entities to develop their literary and artistic talent. Writers whose work is geared towards social and environmental causes with the purpose of raising awareness and inspire change have the right to count on the support of public and private entities for the dissemination and commercialization of their work. Hispanic literary organizations, Hispanic Heritage Literature Organization/Milibrohispano among them, have the right to receive support to develop new talents, endorse writers’ work, and develop a high-level cultural agenda in favor of quality and individual and collective advancement of literary guilds, and the cultural exchange with countries speakers of other languages. Our organization, Hispanic Heritage Literature Organization / Milibrohispano has the right to receive the support of international organizations that safeguard peace, since our work contributes to cultural sensitivity, tolerance, inclusion, equity and the respect of human rights and the environment. International Celebration of Hispanic Book Month. Literary festivity created and directed by writer Pilar Velez in 2013 and that takes place annually, during the Hispanic Heritage Month, between September 15th and October 15th. This activity is supported by a group of Goodwill Ambassadors living in different cities throughout the world. Thanks to their leadership it is possible to organize a cultural agenda that promotes Hispanic literature and strengthens bonds between literature, arts, and society. Vision. To become an effective international platform that provides culture, wellbeing, and literary growth through a Literary Events Agenda that promotes the dissemination of written works by Hispanics. Mission. To strengthen our drawing power to allow the International Celebration of the Hispanic Book Month consolidate in the world cultural agenda, with the purpose of promoting Spanish language reading and writing, supporting the work of writers and the people involved in the editorial industry and promoting the wealth of our Hispanic culture. Arts with a Purpose. With the purpose of uniting talents and consciences, we link literary activities to language expressed through sounds and taste, the power of colors, the creativity of shapes and the universe of images. We support initiatives that encourage creativity and expression, and that fulfill a social role that goes beyond aesthetics. Environmental agenda. Aware of the problem that affects the environment and the need to promote the love for life and respect towards nature, Hispanic Heritage Literature Organization, has begun a campaign in our literary magazine Poetas y Escritores Miami, with the purpose of motivating writers to include the environment as a vital subject in their literary creations and to provide articles that encourage the preservation of the environment, including columns and creative works about the good use of water, recycling, the importance of forest preservation and adopting a lifestyle that doesn’t harm the environment and its ecosystems. We are also present and support several activities set out by environmental organizations within Florida and out of state. XII Encuentro Internacional de Escritoras (EIDE) dedicated to Marjory Stoneman Douglas. 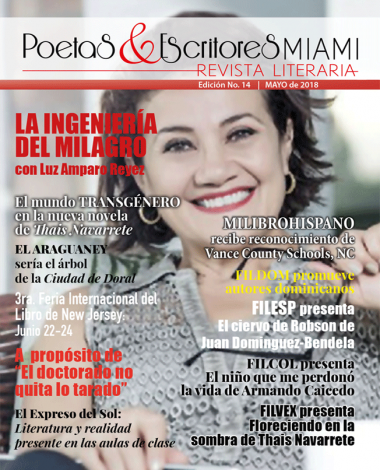 This event, which originated in Peru thanks to the initiative of writer Elizabeth Altamirano, has been embraced by our organization with the purpose of strengthening ties with the international literary community, support the leadership of women writers and disseminating the legacy of writer Marjory Stoneman Douglas. Hispanic Heritage Literature Organization will always support in future EIDE, the importance of environmental and water topics, particularly, as subjects of literary interest. Marjory Stoneman Douglas International Environmental Literature Contest / Short Story Category. This contest was planned for 2016. However, it was postponed until 2019 with the purpose of strengthening participation in both languages, English and Spanish. Hispanic Heritage Literature Organization will carry out this event annually. Marjory Stoneman Douglas Literary Contest for Florida students / Short Story Category 2019. Subject: Ecosystems of the Everglades. The winners, as it’s our custom, will receive bicycles as awards. The best works will be published in a book. Luis Alberto Ambroggio International Poetry Contest. This contest is directed to the Hispanic community, and it will be carried out annually after 2017. Spelling Bee – Spanish. This project was initiated by the Spanish professor, Mary Franz Soriano, in North Carolina. Thanks to her efforts, the project, which seeks to promote written and oral knowledge of the Spanish language has extended to all the schools in a county, involving parents. Spelling Bee is part of a program that consists of the participation of writers, the reading of Spanish texts and a series of activities under the professors’ instructions, and it’s in the process of being implemented in other places. Milibrohispano libraries. This project started in September 2016, thanks to book donations by authors and readers. The objective is to gather this material and offer it to centers and residences for the elderly, where books written in Spanish are needed. Values: We believe in ethics, in the right to education, in the protection of life, in work, in the search for excellence, the desire for improvement, the compromise of word and actions, in freedom, in friendship, in solidarity, in diversity, in respect and human dignity. We believe that authors are agents of change.